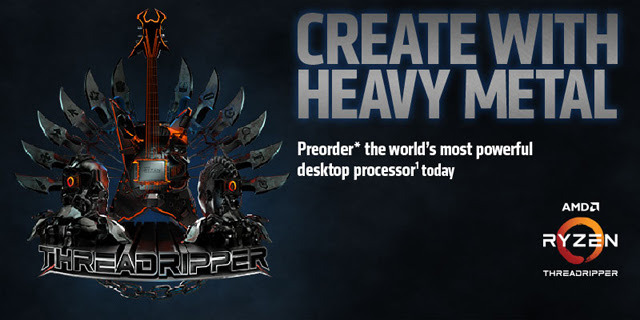 The day is here to pre-order the second generation Threadripper from AMD at more than 80 e-tailers worldwide. This includes the Threadripper 2990WX which currently holds the world record in Cinebench R15 multi-threaded CPU test for a single socket system. During a press event last month, the AMD Ryzen Overclocking team managed to push the 2990WX to over 5.1 GHz using liquid nitrogen. The team managed a score of 7,618 beating the current single socket record of the Core i9-7980XE of 5,828. This also beat the mysterious 5.0 GHz, Intel 28-core CPU demoed at Computex earlier this summer which scored 7,334 in the multi-threaded Cinebench R15 CPU benchmark. AMD is staggering the release of the second generation Threadripper CPUs from August 13th for the 2990WX, the 2950X will be available on August 31st and the remaining 2970x and 2920X will be coming in October 2018. See the table below. All the second generation Threadripper CPUs will be supported on new and current X399 Socket TR4 motherboards available from all the major partners. Along with a wide range of motherboards, socket TR4 supports a variety of new and existing coolers such as the new Wraith Ripper air-cooler showcased at Computex 2018 alongside the new Threadripper and it’s available from Cooler Master. With 64 PCIe Gen 3.0 lanes and quad-channel DDR4 memory with ECC support the new second generation Threadripper is tailored to HEDT(high-end desktop) delivering the ultimate desktop computing power for the most intense workloads. Beginning today Monday, August 6th, 2018 e-tailers such as Amazon and Newegg are ready to start taking orders for the 32-core, 64-thread Threadripper 2990WX launch. For a complete list of participating e-tailers and product launch information follow this link to www.AMD.com. Dat 2950X tho, 4.4 GHz boost... Shows a LOT of promise for 7nm in the coming year or so. It's the end of the current design. The process won't help as already we can't see a big difference between 1st and 2nd gen of Ryzen. It's just that the best chips can boost up to that 4.4GHz on single cores. I really count that new Ryzen will be designed to handle higher wattage and its efficiency will be better at higher clock. Now I wonder how many of these 32 core TR will be sold as 1st gen was pretty much sales fail (still huge marketing success). Cinebench R15 leader board link? I cant imagine its actually posted in public considering the cpu isnt out yet and amd pulled it down off their page. Eeep. Not getting one of these any time soon. The UK price is £1600 for the CPU alone == US$2100.